The Jorvik Viking Festival returns to York once again from 12 to 18 February 2018. There are plenty of events to look forward to throughout the festival. These include the Curator Tour & Talk, the Feast of JORVIK and the Festival Finale. Tickets range from £3.50 to £85.00. The good news is that B+B York is offering a 20% discount on all tickets to the Jorvik Viking Festival. Invasion: The Dawn of Viking York! The annual JORVIK Viking Festival is widely recognised as the largest event of its kind in Europe. Prepare yourself to be amazed by fire breathing displays, sword fights, parades, armoured warriors…and beards. 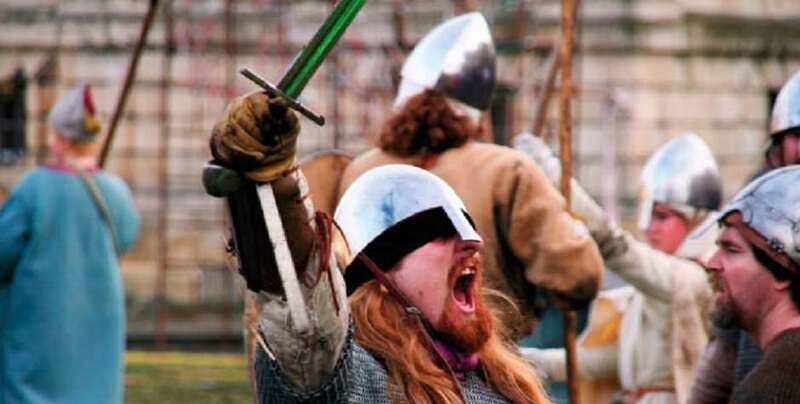 If you love the roar of battle and good old fashioned Viking fun, get yourself over to York this February. The JORVIK Viking Festival is a celebration of the defiant conquest of England by the Great Viking Army in AD 866. With an exciting programme of events that explore the impact of the Viking invasion of Anglo-Saxon England, including living history encampments, walks, talks, tours and of course, dramatic combat performances, there is something for everyone at the JORVIK Viking Festival. If you are on social media, we invite you to use the hashtag #JVF18 to follow all the action. The Jorvik Viking Festival is a ton of fun and is definitely not to be missed. If you intend to visit beautiful York to experience all the action, please plan ahead. Accommodation at this time of year is in high demand. B+B York is perfectly located with quick access routes to all the attractions. Contact us today to arrange your booking. Telephone +44 (0) 1904 559 777 / Email: info@bb-york.com – we hope to see you soon. This entry was posted in B+B York, News, York and tagged Festival, JORVIK, Jorvik Viking Festival, Yorkon 12th January 2018.